Thanksgiving greetings! 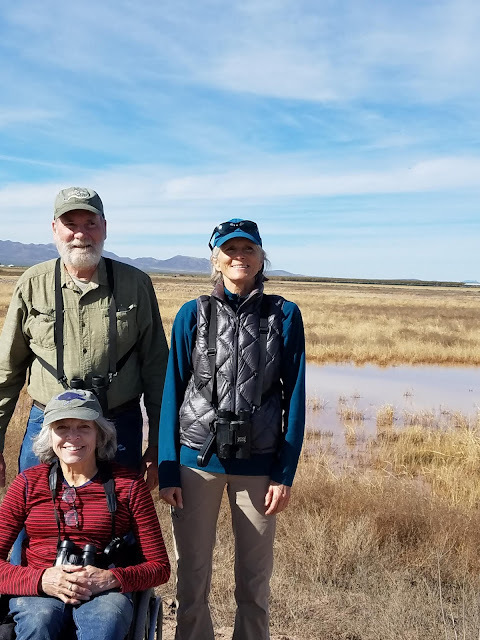 I had the great good fortune to visit Whitewater Draw in southeast Arizona to watch the cranes. My sister Cathryn packed a picnic lunch of pate', bread, gouda, and pear and drove us the easy hour and a half from Tucson. It was a beautiful day! We immediately heard the cranes as we pulled into the parking lot, and then witnessed necklaces of cranes floating in from every direction. Over the next three hours, we saw pairs of two, groups of ten and twenty and fifty and one hundred fly in to settle with the thousands that were already on the ground. The honking was continuous until about 2:00 in the afternoon, when a peaceful quiet settled in. Truly a lifetime experience for me. Although the area does not have sidewalks, the views of the cranes coming in were fabulous. The trail is flat packed earth, and I was able to wheel independently with only very occasional assistance through a few small patches of gravel. We were able to get incredibly close to the cranes. In addition to the wonder of the cranes, a dozen bright white snow geese joined the flock. We were also provided with wonderful murmurations of blackbirds, some of which we think were yellow-headed. For those unfamiliar with murmuration, it is the phenomenon of the schooling of fish and or birds as they maneuver in extremely large numbers to form magnificent transforming shapes. As they flew just feet over us, we were mesmerised by the sounds of their wings. Another extraordinary experience. Northern harriers patrolled the area, as did merlins and red tailed hawks. The secretive marsh wrens regaled us all day from the rushes. A very busy and vocal black phoebe sallied out at least a hundred times. A vermillion flycatcher glowed like a bright red lantern in a nearby cottonwood tree, and two Say's Phoebes chased each other over the marsh. We also saw American wigeons, lesser scaups, coots, northern shovelers, mallard and Mexican ducks. We departed reluctantly as the afternoon yawned into early evening with the sounds and visions of the cranes stowed safely in our hearts. What a wonderful treat! Sounds like an amazing trip with your sis. Love the idea of an afternoon "yawning into evening." How lovely!